At Apple’s iPhone event, CEO Tim Cook did a funny thing. He took a moment before introducing the new iPhone 4S to introduce two new iPods: a $199 iPod Touch running iOS 5, featuring Facetime and an HD video camera, and a quite cheap iPod Nano (just $129 for the entry-level model) tricked out with new sensors. Now, I only say it’s funny because with iPhone mania — including the maniacs who are outraged! outraged! that Apple “only” introduced a hardware spec and software OS upgrade to its best-selling iPhone ever — made everyone forget about the iPod. Even though Apple has sold over 300 million iPods for billions and billions of dollars, including 45 million in just the year ending in June. That’s 78% of the global music player market. 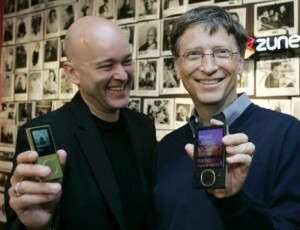 Microsoft's Bill Gates and J Allard with two Zune models in November 2007. But in a smartphone and tablet world, who still cares about music and media players? It’s probably fitting that on the same day that Apple unveiled its new iPhone, Microsoft finally confirmed that it would stop producing its Zune media players. Microsoft has now fully conceded to Apple’s vision, made just after the Zune was introduced in 2006, with the first iPhone: the future of the media player is in the reimagined smartphone. In Microsoft’s case, that’s Windows Phone 7. What’s funny is that Apple never actually fully conceded that point itself. Instead, it brought its touchscreen smartphone OS to its iPod media players. Then it went bigger, by rethinking the tablet as an app-driven, lean-back touchscreen media device with iPad. Then smaller, by adding elements of iOS and its multitouch interface to the iPod Nano. Because Apple dominates media players and tablets, iOS is still the top mobile operating system. (Wired’s Brian Chen once called the iPod Touch “Apple’s stealth weapon for mobile growth.”) That larger mobile ecosystem delivers third-party apps and Safari web browsing and Apple services, despite the truly gigantic number of Android smartphones that have been sold. And really, the iPad could be seen as a media player as much as an ultraportable computer, just as the iPod Touch could be seen as an ultramobile computer as much as a media player. Even if Apple let the iPhone gobble up the premium spot on the calendar it once used to launch iPods for the holiday season, it has never let the iPod disappear. Instead, it’s continually rethought what its flagship media player should do, and fought to price it aggressively. The media ecosystem, in turn, helps drive and support the device. (You can have a smartphone without big-time media support, but not anything else.) But the iPod is also something different. Gaming: It’s ridiculous that Microsoft doesn’t totally own this category, and that Apple arguably outcompetes Sony and Nintendo, too. Android tablets, even reading-driven ones like Nook’s and Amazon’s, are trying to carve off a chunk of this low end, without much success. 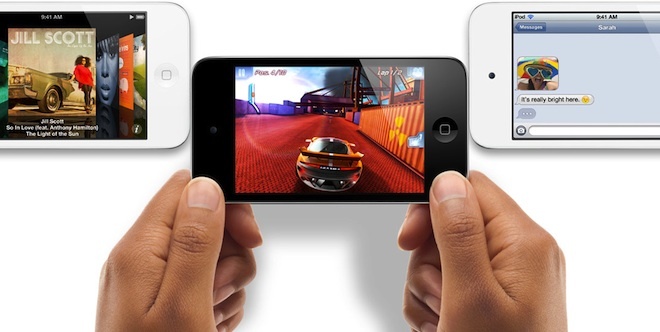 The iPod Touch has a gyroscope, which opens it up to much more physical gameplay; the Kindle Fire doesn’t. Facetime and iMessage. The new iPod Touch is actually a pretty astonishing digital-native communication device, beaming out video and text without paying a single penny to the telephone companies. And think about it: With those two features in place, and ever more ubiquitous wi-fi, can you think of a reason a teenager actually needs a smartphone? Or even most college students? For Apple, in turn, iPods are a gateway device to building their customer base. Whether you’re a teenager who wants to Facetime, a little kid who wants to play video games, a Windows or Linux user who needs something to listen to at the gym, or a customer in an emerging market where the iPod may be the only Apple device that’s fully supported, the iPod is still many people’s first Apple product. And then, often, not their last. Can anyone compete with that? Could we see a mobile non-phone from Microsoft built around Xbox gaming? A “Kindle Spark” with a 4-to-5-inch screen and communication and media recording capabilities comparable with the iPod Touch? Because as long as iPods hold the door open for Apple, everyone else is just fighting to beat them in one chunk of the iOS empire. They’ll never be able to disrupt the entire thing.